A sun-kissed skin looks so flattering, making our skin look radiant, youthful and firm! 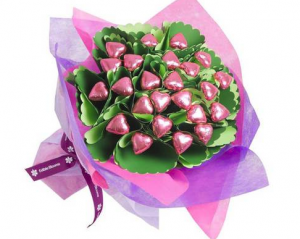 Who doesn’t want that, especially for special occasions! The dilemma of course is that none of us wants to risk the dangers of the sun. 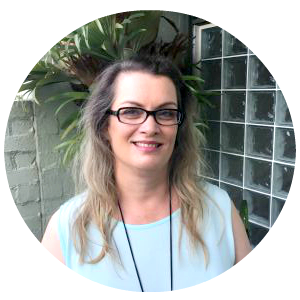 To assist solve the dilemma I have put together this comprehensive guide to self tanning, the ultimate guide to achieving the best fake tan Australia 2019. Not only does this ultimate guide contain valuable self tanning tips but it also contains recommendations of the best self tanning products Australia wide. Click HERE to see the best self tanner 2019 and click HERE to see the best face tanner. Use this chart to compare the recommended best fake tans Australia wide to identify the best tanning products 2019 Australia wide for your specific needs. Comparison chart listing the recommended best self tanning products. Specific reviews of each product can be found further down this article. Keep reading to check out the best self tanners 2019 Australia reviews below. Foam and mousse formula self tanners are wonderfully user friendly. They are easy to apply and you can see exactly where you have applied the formula and where you have missed. For the best result apply foam and mousse formulas with an applicator tanning mitt using long sweeping motions. The Bondi Sands tanning foam formula products are the best tanning foam 2019 products I’ve tried. They are all strong contenders for the overall best self tanner 2019 Australia wide. Click here to see the recommended Bondi Sands Self Tanning Foam, Dark, the Bondi Sands Self Tanning Foam, Ultra Dark and Bondi Sands Express Self Tanning Foam. Spray tan products provide the most even colour distribution but you can’t apply these easily to your own entire body. One of my best spray tan tips is to ask a friend to help you. You will need them to spray you where you can’t reach, such as your back. Click here to see the recommended best spray on self tanner: ModelCo Tan Airbrush in a Can. Self tanning lotions tend to be fast drying. You need to apply these types of self tans quite quickly. The benefit of lotion and gel type fake tan formulae is that they are nourishing on the skin. A gradual tanner is the best fake tan for beginners to use and the best fake tan for pale skin Australia wide. A gradual tanning moisturiser contains only a small amount of tanning ingredient and is applied exactly like a regular body moisturiser. You can build up the colour by applying the product on several consecutive days in a row. After trialing a number of different gradual tan products this is my product pick for the best gradual tan 2019. Gradual tan moisturisers are also the best fake tan for older skin as they are effective in combating the dehydration issues more common in mature skin. Click here to see the recommended best gradual tan moisturiser Australia 2019 wide, Jergens Natural Glow Firming Daily Moisturizer. It gradually creates a beautiful natural looking colour. It comes in Medium to Tan and also Fair To Medium. The Jergens Natural Glow Firming Daily Moisturizers also have the added benefit of creating visibly firmer skin with improved elasticity. This is the best gradual tan Australia 2019. Another gradual self tanner perfect for first timers is the St Tropez Gradual Tan In Shower. This innovative gradual fake tan takes minimal effort. It’s the best gradual tanning lotion Australia wide for those wanting to apply fake tan whilst in the shower. Unlike other self tanners this one applies to wet skin. Wash, turn off the shower, slather on and wait for 3 minutes, (you can apply a hair mask while you wait) then rinse off. So easy! You can use it daily to build up the glow. The result is a lovely subtle glow. This gradual tanner is also a strong contender for the award of best gradual tan for pale skin Australia wide. All the St Tropez Gradual Tan In Shower reviews I have read have all been overwhelmingly positive. This is the best gradual tanner Australia 2019 for in shower use. Click here to check out the St Tropez Gradual Tan In Shower. A temporary tan is your self tan formula of choice when you want a fake tan for a special event but don’t want it to last any longer than the event. It’s also a good option for people that have never tried a fake tan before and are unsure of how it will suit them. Temporary tan body bronzers are a bit like makeup for the body that can be washed off after you no longer want it. This is the best instant tan Australia wide. It is also the fastest best fake tan legs option in my opinion. Numerous instant fake tan reviews Australia wide agree with this statement. Click here to check out the Sally Hansen Airbrush Legs temporary tan. Bondi Sands Self Tanning Foam Dark is the best selling self tanner in Priceline and for very good reason. In fact, a lot of the best tanning products Australia wide are from Bondi Sands. Bondi Sands foam self tanners are user friendly, easy to apply, absorb fast and result in a perfect tan. This self tanner is enriched with aloe vera and scented with coconut. It lasts almost a week on my skin, comes off gradually and not in patches. The resultant rich natural looking golden glow tan is just perfect! There is no tinge of orange-ness to this tan! This is the best self tanner Australia 2019 that I’ve used! Click HERE to purchase the Bondi Sands Self Tanning Foam in Dark. The Bondi Sands Self Tanning Foam in Utlra Dark is very similar formula wise as the above Bondi Sands Self Tanning Foam in Dark but results in a deeper bronze tan. This is the best self tan Australia wide for those wanting a beautiful darker tan. Click HERE to purchase the Bondi Sands Self Tanning Foam in Ultra Dark. This is the best self tanner for last minute tanning. It results in a light to medium tan in 30 minutes. If you leave it on for an hour you achieve a wonderful deeper sun kissed looking tan. This is the best 1 hour fake tan I’ve used. Needless to say it’s also the best 30 minute fake tan I’ve used too! This tan applies easily like the other Bondi Sands foam self tanners. It is quick drying on your skin. As I tend to always be short of time and leave things to the last minute I keep a bottle of Bondi Sands 1 Hours Express Self Tanning Foam in my bathroom to use when needed. Click HERE to purchase Bondi Sands 1 Hour Express Self Tanning Foam. The MineTan Nano Mist Atomiser is definitely the best face tanner Australia wide that I have seen! It’s also the best vegan fake tan and best cruelty free fake tan I’ve come across. The new on the market MineTan Nano Mist Atomiser is a complete tanning game changer! It’s the ultimate compact beauty tool that combines an amazing facial moisturiser with a self tan. It atomises tan solution into tiny nano sized particles designed for faster penetration and leaves your skin feeling soft, hydrated and refreshed with a flawless skin finish. It has a fast drying formula that builds a natural tan gradually over the next few hours. The atomiser must be used with the included Nano Mist Drops and can’t be used with other tanning solutions as the Nano Mist Drops have been specially formulated to atomize in the device. Other tanning solutions will block up the spray nozzle. Refills can be purchased. You can re-apply to achieve your desired colour depth. It has an easy to use refill dropper & USB charger. It’s the perfect solution for a golden glow on the go. I find it great for topping up the tan on the back of my hands which fades faster than the rest of my tan probably due to my frequent hand washing. Impressively this product is also paraben free. Click HERE to purchase the MineTan Nano Mist Atomiser. ModelCo Tan Airbrush in a Can delivers an even looking natural tan that deepens over four hours after application. It contains aloe vera to nourish your skin and leave it feeling soft and moisturised and is scented with coca butter. Spray tans offer the most even colour distributed tan and a beautiful resulting natural looking tan but I recommend asking a friend to help you apply it as some areas of your body are simply too difficult to reach yourself. I’d also be careful where I was using this spray as the fine mist can go everywhere. Personally I peg up a big tarp around my shower to ensure I don’t need to scrub fake tan off my shower recess and tiles. I have a friend who applies her spray tan outside on a grassed area. Click HERE to purchase MocelCo Tan Airbrush in a Can. Jergens Natural Glow Firming Daily Moisturizer is a body moisturiser that gradually tans skin and reduces the signs of cellulite. You do need to use this product on several consecutive days to build up the colour. The resulting colour this product achieves is a sun kissed natural looking shade. It comes in two different shades: Fair to Medium and Medium to Tan. Jergens Natural Glow Firming Daily Moisturizer is the best fake tan to use when you are not only wanting a gradual tan but are also wanting the added benefit of firmer skin with improved elasticity. I love these sort of multi tasking products! Click HERE to purchase Jergens Natural Glow Firming Daily Moisturizer in the shade Fair to Medium. Click HERE to purchase Jergens Natural Glow Firming Daily Moisturizer in the Medium to Tan shade. St Tropez Gradual Tan In Shower is the best tanning lotion specifically formulated for use in the shower. It is quick and easy to use and virtually mess free. St Tropez Gradual Tan In Shower is as the name states a gradual tan and I recommend using it several days in a row for the best results. It results in a lovely subtle tan. This is one of the best self tans for beginners and also the best fake tan for fair skin Australia wide. Click HERE to purchase St Tropez Gradual Tan In Shower. This temporary tan transfer-resistant makeup has been designed specifically for the legs. It is the best instant fake tan Australia wide for legs. Sally Hansen Airbrush Legs is a lot faster to apply than a traditional fake tan that needs to develop. You do need to blend it out a bit using a tanning mitt. It effectively covers freckles, veins and other imperfections and is enriched with vitamin K. It has a pleasant scent. Sally Hansen Airbrush Legs is the best fake tan for legs when you’re in a hurry and only want a temporary tan. It’s perfect for applying to your legs prior to going out clubbing or to a special event when you want your legs looking their best! Click HERE to purchase Sally Hansen Airbrush Legs. 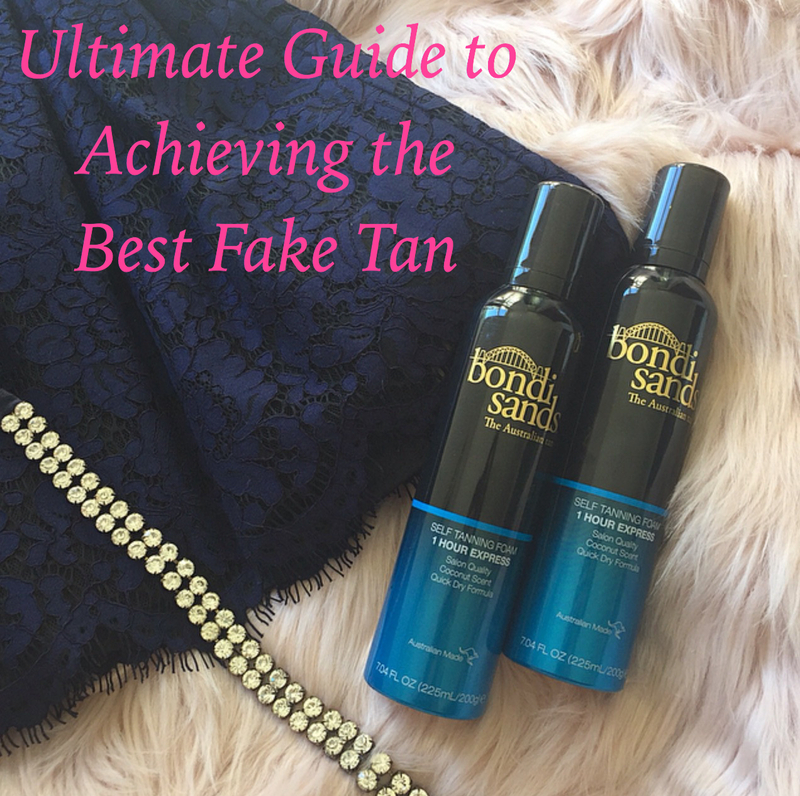 All self tanner and fake tan products come with their own set of instructions which I recommend you follow to achieve the best results when using that particular self tanning product. Even when using the best self tanning Australia products you won’t necessarily get the best results that you desire unless you follow the instructions accompanying that product. For your information I’ve also compiled this tanning guide of some universal self tanning tips for ensuring the best long lasting fake tan. Shave, wax or use an alternate hair removal technique the day before applying self tan. Exfoliate and remove old fake tan using an exfoliating mitt. This will ensure a more even and longer lasting tan. For more information about the best way to remove fake tan see the specific ‘How To Remove Self Tan’ section below. 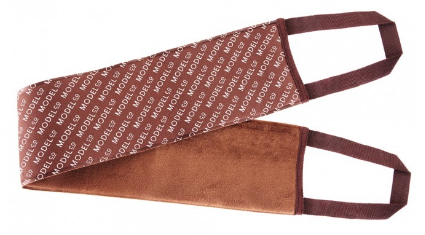 Use a tanning mitt to ensure a natural, streak free tan without stained hands. Use a self tan back applicator for more easily applying the self tan to your back. Do not use moisturiser, body lotion, deodorants or fragrances on the day of applying the self tan as these can act as a barrier to the fake tan and result in an uneven blotchy result. Some fake tans recommend moisturising first however. Always follow the instructions provided with the fake tan product you are using. Apply to clean, dry skin. Note in shower tanning lotions are an exception to this. Apply sparingly over elbows, knees, ankles and feet where the skin is dry. It’s a good idea to moisturise these areas first to create a barrier to avoid over tanning these areas. Wait for the product to dry completely before getting dressed. Moisturise your skin to prolong your tan once your tan has full developed. It’s important to remember that a fake tan does not protect your skin from the sun. You still need to apply sun protection. Click HERE to see how much sun screen is recommended. You may also be interesting in reading our Cracked Heels guide which details the causes of cracked heels and more importantly how to fix cracked heels to have your feet looking their absolute best! Click HERE to read. Preparation is key to achieving the best flawless finish fake tan result possible. Fake tan grips more to dead skin cells, so buff them and any residual fake tan away in the shower using an exfoliating mitt prior to self tanning to ensure a more even and longer lasting tan. 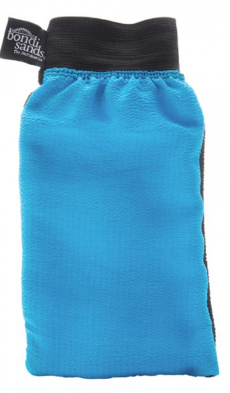 Click HERE to check out the recommended Bondi Sands Reusable Exfoliating Mitt. Always use a tanning mitt / self tanning glove to achieve the best streak free self tan finish with the best even colour distribution while keeping your hands stain free. I’ve used several dud self tanning mitts in the past that break apart after only a couple of uses or leave hard to remove fibres on your skin whilst you use them. The best tanning mitt Australia wide that I’ve found is the St Tropez Tan Applicator Mitt. 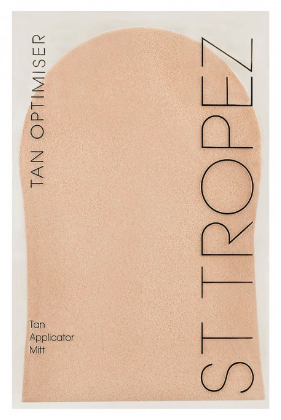 Click HERE to check out the recommended St Tropez Tan Applicator Mitt. A commonly asked question is how to fake tan your back. Without the proper applicator it is difficult to apply self tan evenly to your own back. You definitely need a fake tan back applicator. Not only does a self tan back applicator help you access difficult to reach areas for a flawless self tan but a back tan applicator also protects your hands from unwanted tanning stains. Click HERE to check out the recommended ModelCo Self Tan Back Applicator. The best way how to remove fake tan and how to get fake tan off is to use a fake tan eraser. My preferred fake tan eraser product is the Bondi Sands Self Tan Eraser. Bondi Sands Self Tan Eraser is super easy and effective to use! This is not only a fabulous method of how to remove Bondi Sands fake tan but other brands’ fake tan too. The Bondi Sands Self Tan Eraser also moisturises the skin and leaves it feeling wonderfully silky smooth. In my opinion Bondi Sands Self Tan Eraser is the best fake tan remover Australia wide. Another of my fake tan removal tips is to use an exfoliating mitt such as the Bondi Sands Exfoliating Mitt for any remaining stubborn areas of fake tan or dry skin. Click HERE to check out the recommended Bondi Sands Self Tan Eraser and Click HERE to check out the recommended Bondi Sands Reusable Exfoliating Mitt. What is your preferred choice of fake tanner? THIS ARTICLE MAY CONTAIN COMPENSATED LINKS. ALL OPINIONS ARE MY OWN. PLEASE READ OUR DISCLAIMER FOR MORE INFO. That is a really nice compilation of the tanning products. Love the short descriptions and comparison, so helpful. This is a great guide for someone who doesn’t know where to start! My current favourite is the Jergens Natural Glow Firming Daily Moisturizer. Posts like this are SO helpful for fake tan newbies such as myself! I’m normally a gradual tanner so will need to check out the Jergens one! Great recommendations! My brother and sister in law swear by Bondi Sands! They love the convenience of the in shower lotions as well. This is the best guide to refer back to! You’ve done all the hard work for us, loving the comparison chart!